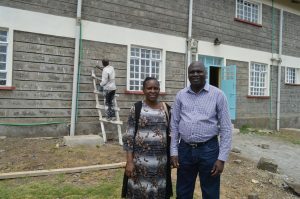 The Emmanuel orphanage home began in 2004 by Pastor Ismael Wagongo and Mrs. Carren Wagongo. It was while walking along the streets of downtown Nakuru that Pastor Ismael came across some street children begging for food. It occurred to his notice and surprise that many people were just passing by these street kids and were not very kind to them. Some people even pushed these kids away not even wanting to listen to their needs. After speaking with a few of them, he noticed that most of these kids were orphans who had lost both of their parents and didn’t have anywhere else to go but to the streets. Others had been left with their old grandparents who were so weak that even affording them a livelihood was not possible, so they had run away. As a concerned father, He saw the real suffering of these kids on the street while scavenging their food from trash cans and living in dark alleys with no shelter. He thought of how he could help them and what he could do however small, just to make it a little better for them. It is at this time he heard God speak to his heart about the kids on the street. God impressed on his heart to put them in a home. At that time he didn’t understand how it would be possible since at his home they already had two kids of their own and together with his wife they didn’t have enough for another extra child. However, because of the love of God and these orphaned children they decided to obey. He discussed with his wife about the vision he received from God, and together they decided to start an orphanage home. They began by bringing one orphan into their one bedroom house. At the time, they were having 2 of their children who gracefully accepted the orphans.